HEALTHY AND ECO-FRIENDLYE: Healthy ingredients gel polish, low smell, non-toxic, harmless resin. 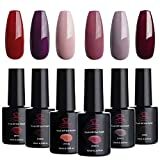 CHARMING GLAMOUR GEL SERIES WITH GIFT BOX: Hot color assortment for glamour women series in 2019 and convenient to use. Packed in an exquisite gift box and will be a great gift for friends. REQUIRE: Cure under LED/UV nail lamp. Color resistant, flexible and shiny resistant to any test.